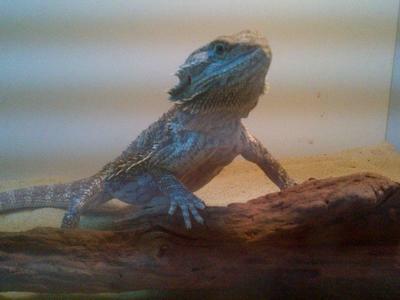 Paul, my mums boyfriend got a beardie -her name was lola she was 3 monthes old and then I wanted one, I got rocko who lola was bought from, we took him to see her and the man said they are sisters but rocko was a boy. Weeks went past and rocko got terrotorial and attacked lola -she survived the 1st bite which 5 bones were broken by his bite and then we seperated them and rocko climbed the wall and got to lola and attacked her, puss came from her arm and she went to the hospital and died of gangreen spreading throughout the body, that's why you don't buy a dragon from a dodgy breeder. Join in and write your own page! It's easy to do. How? Simply click here to return to Bearded Dragon care tips or stories.